The Dawoodi Bohras (Arabic: داؤدی بوہرہ‎‎) are a sect within the Ismā'īlī branch of Shia Islam. Bohras mainly reside in the western cities of India and also in Pakistan, Yemen and East Africa. The main language of the community is "Lisan ud-Dawat", a dialect of Gujarati with inclusions from Arabic, Urdu and other languages. The Script used is Perso-Arabic. When in communal attire, a bohra male has a form of Tunic called Kurta, equally lengthy overcoat dress called Saya, and a izaar typically donned underneath, all of which are mostly white, along with a white and golden cap called Topi. Most men have a beard. A bohra woman wears a two piece dress called a rida. The Dawoodi Bohra follow a sort of Shi'ite Islam as propagated by the Fatimid Imamate in medieval Egypt. They pray 3 times a day joining both afternoon prayers Zuhr & Asr and both evening prayers Maghreb & Isha, fast in the month of Ramadan, perform Haj and Umrah and give Zakat. The Dawoodi Bohras, being Ismailis and thus Jafaris, were included as Muslims in the Amman Message. There are some criticisms of the Amman message. The word Bohra comes from the Gujarati word vehru ("trade"), in reference to their traditional profession. The term Dawoodi comes from the support given to Dawood Bin Qutubshah during a schism that the community faced in 1592 when there was a leadership dispute. 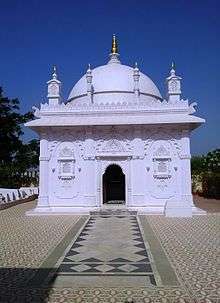 The Dawoodi Bohra sect is a Shia sect also referred to as the Tayyabī Musta'lī Ismā'īlī sect. The Isma'ilis were split from the now mainstream Ithna Ashari Shias over the succession issue of Imam Jafar Al-Sadiq. The Isma'ilis took Isma'il bin Jafar as their Imam whereas the Twelvers (Ithna Ashari Shia) took Musa Kazim bin Jafar Al-Sadiq as their Imam. The Ismailis split into Druze and mainstream Isma'ilis due to a succession issue and further down the line they again split into Nizari and Musta'ali branches. the Musta'ali branch to which Dawoodi Bohra trace their legacy continues until the 21st Imam Al-Tayyab, who went into occultation (hiding). His direct descendent is considered as the current Imam and remains in seclusion. While the Imam is in seclusion, the governance of the sect has been entrusted to the Da'i al-Mutlaq (Unrestricted Missionary). 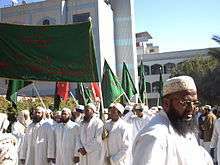 Splinter groups of the Bohras have subsequently emerged over the succession dispute of the preceding Dai. As Shi'a Muslims, Bohras believe that their Imāms are descendants of the Islamic prophet Muhammad by way of his daughter Fatimah and her husband Ali. They believe that Muhammad chose Ali as his successor and publicly declared this while he was returning from his first and last Haj in 632 CE. Dawoodi Bohras, in keeping with all Shi'a believe that after Muhammad, Ali had been the rightful wasi, Imam and caliph, but the actual Caliphate was usurped by Ẓāhirī ("literalist") caliphs. Ali was the final Rashidun Caliph from 656-661 CE; the Imamate and caliphate were united in this period. After Ali, his son Hasan ibn Ali, the first Ismāʿīlī Imam, was challenged for the Caliphate, ultimately resulting in a truce with the Umayyad Caliphate to recognise the claimant in power, Muawiyah I, as Caliph and avoid bloodshed, while Hasan retained the Imamate. After Hasan, Husain and his family and companions were killed at the Battle of Karbala and Husain's body was buried near the site of his death. 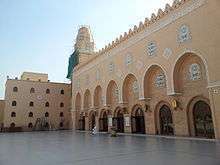 Dawoodi Bohras believe that Husain's head was buried first, in the courtyard of Yazid (the Umayyad Mosque), then transferred from Damascus to Ashkelon, and then to Cairo. 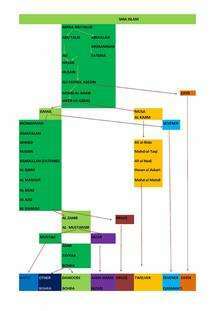 Tree of the Shia Islam. The first through the fifth Ismāʿīlī Imams - until Ja'far al-Sadiq - are commonly accepted by all the Shi'a, although numbered differently. Bohras and Nizari Ismāʿīlīs treat Ali as Vasi (successor to Mohammad) and Imam Hasan as first Imam whereas Twelvers number Ali as the first. The followers of Ja'far's son, Isma'il ibn Jafar, became Ismailis, to whom the Bohras belong. Twelvers believe that Musa al-Kadhim was heir to Ja'far instead; their Imams diverged at that point. During the period of Ja'far, the Abbasid Caliphate replaced the Umayyads and began to aggressively oppose belief in an Imamate. Due to strong suppression by the Abbasids, the seventh Ismāʿīlī Imam, Muhammad ibn Ismail, went into a period of Occultation. During this period his representative, the Dāʿī, maintained the community. The names of the eighth, ninth, and tenth Imams are considered by some traditions to be "hidden", known only by their nicknames due to threats from the Abbasids. However, the Dawoodi Bohra, claim to have the true names of all the known Imams in sequence, including the "hidden" Imams, namely: the eighth Ahmad al-Wafi (Abadullah), the ninth Muhammad at-Taqi (Ahmed ibn Abadullah), and the tenth, Rabi Abdullah (Husain ibn Ahmed). The 11th Imam, Abdullah al-Mahdi Billah, founded the Fatimid Caliphate in 909 CE in Ifriqiya (present Tunisia), ending the occultation. In Ismāʿīlī eyes this act again united the Imamate and the Caliphate in one person. The Fatimids then extended up to the central Maghreb (now Morocco, Algeria, Libya). They entered and conquered Egypt in 969 CE during the reign of the fourteenth Imam, al-Mu'izz li-Din Allah, and made Cairo their capital. After the eighteenth Imam, al-Mustansir Billah, the Nizari sect believed that his son Nizar was his successor, while another Ismāʿīlī branch known as the Mustaali (from whom the Dawoodi Bohra would eventually form), supported his other son, al-Musta'li. The Fatimid dynasty continued with al-Musta'li as both Imam and Caliph, and that joint position held until the 20th Imam, al-Amir bi-Ahkami l-Lah (1132 CE). At the death of Imam Amir, one branch of the Mustaali faith claimed that he had transferred the imamate to his son at-Tayyib Abi l-Qasim, who was then two years old. Another faction claimed Amir died without producing an heir, and supported Amir's cousin al-Hafiz as both the rightful Caliph and Imam. The al-Hafiz faction became the Hafizi Ismailis, who later converted during the rule of Sultan Ṣalāḥ ad-Dīn Yūsuf ibn Ayyūbi. The supporters of Tayyeb became the Tayyibi Ismāʿīlī. Tayyeb's claim to the imamate was endorsed by the Hurrah al-Malika ("the Noble Queen") Arwa al-Sulayhi, the Queen of Yemen. 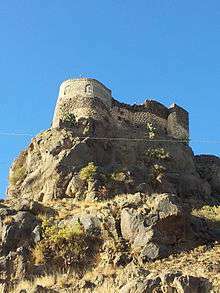 Arwa was designated a hujjah, the highest rank in the Yemeni Dawat, by al-Mustansir in 1084 CE. Under Queen Arwa, the Dai al-Balagh (intermediary between the Imam in Cairo and local headquarters) Lamak ibn Malik and then Yahya ibn Lamak worked for the cause of the Fatimids. Tayyibis (which include the modern Dawoodi Bohra) believe the second and current period of satr began after Imam Tayyeb went into seclusion, and Queen Arwa created the office of the Dai al-Mutlaq to administer the community in the Imam's absence. Zoeb bin Moosa (d.546 AH/1151 CE) was the first Dai-ul-Mutlaq, and lived and died in Haus, Yemen. His ma'dhūn was Syedna Khattab bin Hasan. The 3rd Dai Sayedna Hatim (d. 1191 CE) was prominent among the Du'at of Yemen and wrote many books, both exoteric and esoteric in philosophy on the Ismaili sect. Moulai Abdullah was the first Walī al-Hind in the era of Imam Mustansir (427–487 AH). Moulai Abdullah and Moulai Nuruddin were originally from Gujarat and went to Cairo, Egypt, to learn. They came to India in 467 AH as missionaries of the Imam. Moulai Ahmed was also their companion. Dā'ī Zoeb appointed Maulai Yaqoob (after the death of Maulai Abdullah), who was the second Walī al-Hind of the Fatimid dawat. Moulai Yaqoob was the first person of Indian origin to receive this honour under the Dā'ī. He was the son of Moulai Bharmal, minister of Hindu Solanki King Siddhraja Jaya Singha (Anhalwara,Patan). With Minister Moulai Tarmal, they had honoured the Fatimid dawat along with their fellow citizens on the call of Moulai Abdullah. 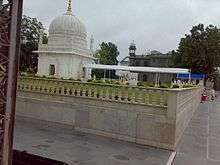 Moulai Fakhruddin, son of Moulai Tarmal, was sent to western Rajasthan, India, and Moulai Nuruddin went to the Deccan (death: Jumadi al-Ula 11 at Don Gaum, Aurangabad, Maharashtra, India). One Dā'ī after another continued until the 23rd Dā'ī in Yemen whilst in Hind the Waliship continued in the descendents of Moulai Yaqoob; Moulai Ishaq, Moulai Ali, Moulai Hasan Fir. Moulai Hasan Fir was the fifth Wali in the era of the 16th Dai Syedna Abdullah (d.809 AH/1406 CE) of Yemen. The Awliya al-Hind were champions of the Fatimid dawat in India, who were instrumental in maintaining & propagating it on instructions of the Dā'ī at Yemen, and it is because of them that the Fatimid dawat was able to survive the persecutions of Cairo and Yemen. The wali Moulai Jafer, Moulai Abdul Wahab, Moulai Qasim Khan bin Hasan (d.950AH, Ahmedabad) and last Jalal Shamshuddin (1567 CE) (12th wali-ul Hind and also became 25th Dai) were of great help in the era of the 21st to 24th Dai. It was during this time when the Dawat was transferred to India from Yemen, that the 23rd Dai-al-Mutlaq Mohammed Ezzuddin performed nass (transfer of authority) on Yusuf Najmuddin ibn Sulaiman of Sidhpur, Gujrat, India. The 24th Dai, Yusuf Najmuddin bin Sulayman (d.1567 CE), shifted the whole administration of the Dawat (mission) to India, in part due to their persecution by the Zaydi Imams. However, Yusuf Najmuddin continued to live in Yemen and died there. The last Wali-ul-Hind and 25th Dai Jalal Shamshuddin (d.1567 CE) was the first Dai to die in India; his mausoleum is in Ahmedabad, India. Dai Jalal's tenure as Dai was very short, only a few months, however, before his nass, he was Wali-ul Hind (after Moulai Qasim) for about 20 years under the 24th Dai Syedna Yusuf while the Dai was in Yemen. Following the death of the 26th Dai in 1591 CE, Suleman bin Hasan, the grandson of the 24th Dai, was wali in Yemen and claimed the succession, supported by a few Bohras from Yemen and India. However, most Bohras denied his claim of nass, declaring that the supporting document evidence was forged. The two factions separated, with the followers of Suleman Bin Hasan becoming the Sulaymanis, and the followers of Syedna Dawood Bin Qutubshah becoming the Dawoodi Bohra. Again in the period of the 29th Dai Abduttayyeb Zakiuddin, a small group of Aliya Bohra separated under Ali bin Ibrahim (1034 AH/1634 CE), the grandson of the 28th Dai Syedna Sheikh Adam Safiyuddin. A further branch broke from the Dawoodi in 1754, with the Hebtiahs Bohra splicing in a dispute following the death of the 39th Dai. Syedna Mohammed Burhanuddin (6 March 1915 – 17 January 2014) was the 52nd Dā‘ī l-Muṭlaq. Dawoodi Bohras believe that the 21st Mustaali Imam, Taiyab abi al-Qasim, is a direct descendant of the Islamic prophet Muhammad through his daughter Fatima Zahra. According to this belief, Ṭayyib Abī l-Qāṣim went into occultation and established the office of the Dā‘ī l-Muṭlaq as the Imām's vicegerent, with full authority to govern the believing community in all matters spiritual and temporal, as well as those of his assistants, the Ma'dhūn (Arabic: مأذون‎‎) and Mukāsir (Arabic: مكاسر‎‎). During the Imām's seclusion, a Dā‘ī l-Muṭlaq is appointed by his predecessor. The maʾzūn and mukasir are in turn appointed by the Dā‘ī l-Muṭlaq. A fundamental belief held by the Dawoodi Bohra is that the presence of the secluded Imām is guaranteed by the presence of the Dāʿī al-Muṭlaq. The 52nd Dai Al Mutlaq, Dr. Syedna Mohammed Burhanuddin served the dawat for 50 years. His main policy was one of Islamisation, countering the modernizing tendencies of his predecessor,. :184–185 Under his rule, a system of strict social control was developed using modern means of communication. Which has now been passed onto the present 53rd Dai Al Mutlaq, Dr. Syedna Mufaddal Saifuddin whom was appointed by Dr. Syedna Mohammed Burhanuddin. A group of reformists, the Progressive Dawoodi Bohra, was formed by Asghar Ali Engineer, but its members have been excommunicated by the mainstream DB clergy. The office of the Da'i al-Multaq; known as Dawat–e-Hadiyah,is central to secular and religious affairs among Dawoodi bohra's. The present office is in Badri Mahal, Mumbai which is represented by Jamaat Committee in all the cities with significant Dawoodi Bohra members. The Aamil is the president of the Jamaat committee, at their respective city. He is appointed by the Dawat–e-Hadiyah with permission of Dai al Mutlaq. There are several sub committee and trusts under the Jamaat committee, who looks after different aspects of Dawoodi bohras administration. The worldwide number of Dawoodi Bohras is estimated at about one million. The majority of adherents reside in Gujarat state in India and Karachi city in Pakistan. There are also significant diaspora populations in Europe, North America, the Far East and East Africa. Dawoodi Bohras have a blend of ethnic cultures, including: Yemeni, Egyptians, Africans, Pakistanis and Indians. In addition to the local languages, the Dawoodi Bohras have their own language called Lisan al-Dawat. which is written in Perso-Arabic script and is derived from Arabic, Persian, Urdu and Gujarati. The centralized, hierarchical organization of the Dawoodi Bohras is maintained largely using (the threat of) excommunication of those who do not conform to the rules laid down by the Syedna and other members of the clergy. Excommunication dissolves marriage and bars burial in Dawoodi burial sites. 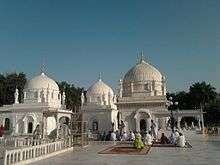 The Dawoodi Bohra maintain a distinct form of attire; the Dawoodi Bohra men wear a white three piece outfit, plus a white and gold cap Kufi (called a topi), and women wear the rida, a distinctive form of the commonly known burqa which is distinguished from other forms of the veil due to it sporting bright colors and decorated with patterns and lace. The ridah can have any color except black, preventing confusion of Bohra women with Sunni women and thus enabling easy identification of fellow members of the community, which in turn is important for maintaining strict social control. The rida additionally differs from the burqa in that the rida does not call for covering of women's faces like the traditional veil. It has a flap called the pardi that is usually folded to one side to facilitate visibility, but can also be worn over the face if so desired. (says journalist Jonah Blank). The Dawoodi Bohra retain the Fatimid-era Tabular Islamic calendar, which they believe matches perfectly with the lunar cycle, not requiring any correction. In this calendar, the lunar year has 354 days. Their odd-numbered months have 29 days and the even-numbered months have 30 days, except in a leap year when the 12th and final month has 30 days. This is in contrast with other Muslim communities, which base the beginnings of specific Islamic months on sightings of the moon, with the naked eye, by religious authorities, which often result in differing opinions as to the occurrence of religiously significant dates, such as the start of Ramadan. Dawoodi Bohras have their own jamaats (local communities) which will be focused around a Masjid or a markaz (community centre) where an "Amil" (leader appointed by the Syedna (TUS) leads namaaz and gives discourses). Dawoodi Bohras have a unique system of communal eating with groups of 8 or 9 people seated around a thaal (particularly large metal tray). Each course of the meal is served for the people around the thaal to share. The place where meals are served is called the Jamaat Khaana. The Jamaat Khaana is usually adjoined to the masjid complex. In 2012, the community leadership under Mohammed Burhanuddin instituted community kitchens in Mumbai that deliver Bohra families two meals per day; the goal of this system is to free women from the task of preparing food, providing them with time to pursue education or economic activities. During the 20th century, the Syednas have established colleges, schools and madrasas in villages, towns and cities all around the world. The focus on literacy and education has meant that the community has a high percentage of degree holders and professionals both male and female with a high number of doctors, lawyers, architects, engineers, teachers and IT professionals in the community in addition to the large number of businessmen and industrialists. Al Jamea tus Saifiyah is the Dawoodi Bohra theological university, which was founded in Surat, India in 1814 AD(1224AH)by the 43rd Dai Syedna Abdeali Saifuddin who named it ‘Dars-e-Saifee". A second campus was founded in 1983 located in the northern foothills of Karachi, Pakistan. A third campus was established in Nairobi, Kenya in 2011, and in 2013 a fourth campus was established in Marol (Mumbai), Maharashtra. The 51st Dai Syedna Taher Saifuddin introduced modern subjects including sciences and arts to the curriculum in 1961 and renamed the academy Al Jamea tus Saifiyah. This process of modernization continued with his son and successor Syedna Mohammad Burhanuddin who introduced 'state-of-the-art' facilities such as the Mahad al-Zahra Quran training Institute. He also made it an International Baccalaureate Office. The academies are administered by a central office located in Badri Mahal, Fort, Mumbai. 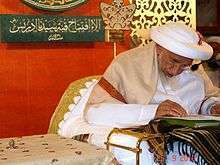 The 51st Dai Syedna Taher Saifuddin was a prolific scholar who wrote more than 40 volumes or 'Risalas' and has penned more than 10,000 verses in tribute to the Shia saints. Many of his works are part of the syllabus in the different fields of Arabic study in Al Jamea tus Saifiyah. The Aligarh Muslim University conferred a Doctorate of Theology on the 51st Dai Taher Saifuddin and offered its Chancellorship. He remained as Chancellor for three consecutive terms until his death in 1965. In October 1999, the 52nd Dai Syedna Mohammad Burhanuddin was also elected Chancellor of the Aligarh Muslim University. Mufaddal Saifuddin was elected chancellor in 2015. Thousands of Dawoodi Bohra visit every year Mausoleums of Ahl al-Bayt especially Medina, Karbala,Shaam and Cairo. 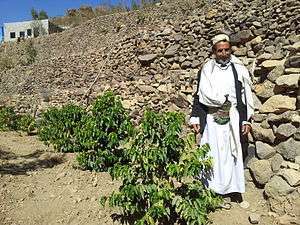 The Dai al MutlaqRA and Wali of Past have been laid to rest in Rauza's, where thousands of community members visit every year, in Yemen and India. 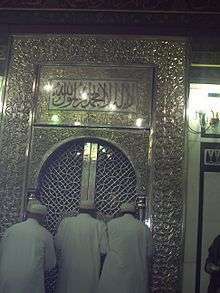 Raudat Tahera (Arabic: روضة طاهرة‎‎ Rawḍatu Ṭāḥiratu), is the Rauza of Syedna Taher Saifuddin. 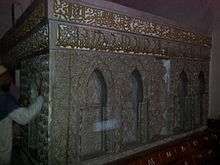 Syedna Mohammed Burhanuddin was buried by his son, Mufaddal Saifuddin in the same mausoleum. For an overview of the Mustaali Shi'a faith, see Mustaali. The Dawoodi Bohras follow the Seven pillars of Ismaili Islam in the tradition of Fatimid Dawat: Walayah (guardianship of the faith), Taharah (purity), salat (prayer), Zakat (tithing), Sawm (fasting), Hajj (pilgrimage to Mecca), and Jihad (struggle). Dawoodi Bohras believe Walayah to be the most important of the seven pillars of Islam. It is the love and devotion for God, through their Dai, Imam, Wasi (Wali) Ali and Nabi Muhammad. There is an incident famous amongst Bohra which confirm how they mean and weigh ‘walayat’ principle. 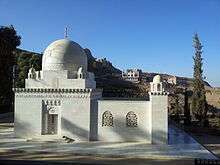 There was an order from 19th Dai Syedna Idris in Yemen to the 6th Wali-ul-Hind, Moulai Adam, to perform prayer behind a water-carrier called Sakka. Moulai Adam along with his associates were willing to perform prayer under Sakka, although this order was later revoked. As a result, the Da'wat was shifted to India. Salat (prayer) as per tradition to be performed five time intervals specified as Fazr, Zohr, Ashr, Magrib and Ishah. Zohr and Ashr are having overlapping period, same is Magrib and Ishah. Hence they are combined together and Bohra perform these five Salat in three intervals. Fazr in morning, Zohr & Ashr in afternoon, and Maghrib and Ishah in the evening, making convenient to perform. As is the case with the majority of Shi'a Muslims, the Bohra append Aliyun waliallah to their profession of faith (kalema‐tut‐ sahadat). The Dawoodi Bohra utilise the versions of the azaan (call to prayer) and shahada common to other Mustaali, which incorporate mention of Ali. Islam prohibits Riba (Usury) and interest; Dawoodi Bohras follow principle of Qardhan hasana, interest free loans. Numerous Qardhan Hasana fund schemes have been established, many working at the local jamaat level and others working at a national level in various countries. The funds are generated from contributions of individual members but the bulk amount comes from the Dai-al-Mutlaq. (In 2014, Mufaddal Saifuddin donated more than Rs. 103.50 crore (Rs. 1.035 billion). Muharram is the first month of the Islamic calendar. The first ten days of this month are marked by Bohras to commemorate the martyrdom of Husayn ibn Ali, the grandson of Muhammad. Dawoodi Bohra begin mourning from the second eve of Muharram and continue with discourses during the day and majlises each night which climax with the day of 'Aashura' on the 10th of Muharram. This is the day on which Husain and his family and 72 of his companions and family were killed by the army of Yazid I at the Battle of Karbala on his orders. The surviving members of Husain's family and those of his followers were taken captive, marched to Damascus, and imprisoned there. Thousands of Dawoodi Bohras flock from around the world to hear the discourses offered by the Da'i al-Mutlaq usually in a different place each year. In October 2016 the Ashara commemorations by Mufaddal Saifuddin  took place in Dar es Salaam,Tanzania. The event takes place in every Bohra community worldwide along the same lines in terms of time and duration. Selected discourses by the Syedna are broadcast live from wherever he happens to be that year. It is Syedna's express instruction that Bohras set aside this time of the year to focus solely on the commemoration by taking the requisite time off from their work, businesses and institutes of education well beforehand. The first Dawoodi Bohra mosque in the West was built in Farmington Hills, Michigan in 1988. Immediately thereafter, the first Canadian masjid was inaugurated by Dr. Syedna Mohammed Burhanuddin in Toronto. Mohammed Burhanuddin inaugurated the Houston masjid in 1996, which was reconstructed into a larger masjid that is four times the size of the original. This new masjid was inaugurated in Oct, 2015 by Mufaddal Saifuddin. In June 2001 Masjid-ul-Badri in Chicago was inaugurated. In July 2004 new mosques in New Jersey (Masjiduz-Zainy), Washington DC and Boston were inaugurated. 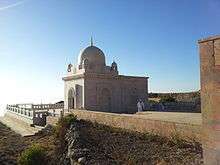 The following year, August 2005, the Dā‘ī l-Mutlaq inaugurated another new masjid in Fremont, California (metropolitan San Francisco) and was congratulated by various officials and dignitaries from local, state and federal US governments. 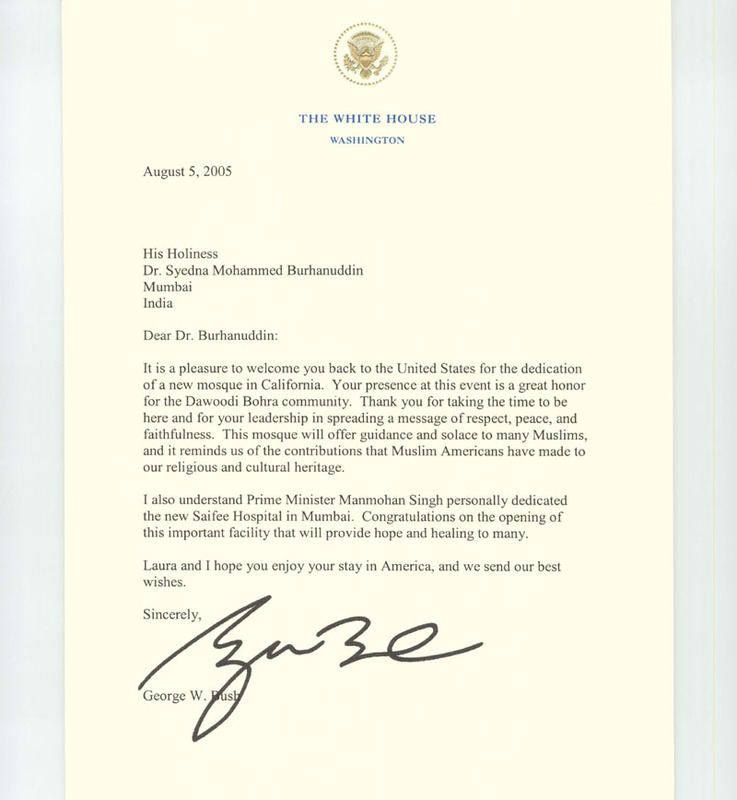 President George W. Bush also sent a letter from the White House. On 8 July 2007, Mohammad Burhanuddin inaugurated a new masjid in Paris, France. V K Singh lauds Dawoodi Bohra community's role in 'Operation Rahat' in Yemen. Ahmedabad, Indian Dai era start with 25th to 33rd Dai (1567-1657) followed by Jamnagar era (34th to 38th Dai) till 1738AD. Grave 51st Dai Taher Saifuddin,Mumbai, era 1915-1965 AD- contd. ↑ "Why Bohra Muslims are so enamoured of Narendra Modi". ↑ "Society: Why we work". 1 2 3 4 5 6 Paul, Eva (2006). Die Dawoodi Bohras – eine indische Gemeinschaft in Ostafrika (PDF). Beiträge zur 1. Kölner Afrikawissenschaftlichen Nachwuchstagung. ↑ Administrator. "The Official Website of The Amman Message - grand list of endorsements of the amman message and its three points". ammanmessage.com. Retrieved 2016-03-11. ↑ "Mufti Desai of Darul Uloom Abu Bakr in South Africa voicing criticisms of the Amman Message". islamopediaonline.org. Retrieved 2016-03-11. ↑ Kumar Suresh Singh; Rajendra Behari Lal; Anthropological Survey of India (2003). Gujarat. Popular Prakashan. pp. 248–. ISBN 978-81-7991-104-4. Retrieved 22 March 2012. ↑ "Sacred Surprise behind Israel Hospital, Batsheva Sobelmn, special Los Angeles Times". ↑ Qazi Dr. Shaikh Abbas Borhany PhD. Brief History of Transfer of the Sacred Head of Hussain ibn Ali, From Damascus to Ashkelon to Qahera. Daily News (Karachi), 1 March 2009. ↑ Ghul, Mahmud; Makarem, Sami N. "The Hidden Imams of the Ismailis". Quarterly Journal of the American University of Beirut. XXI. Nos. 1 2. 1 2 3 Blank, Jonah (2001). Mullahs on the Mainframe: Islam and Modernity Among the Daudi Bohras. University of Chicago Press. ↑ "Tehelka - India's Independent Weekly News Magazine". archive.tehelka.com. Retrieved 2016-03-11. ↑ Michel Adam (2009). L'Afrique indienne: les minorités d'origine indo-pakistanaise en Afrique orientale. KARTHALA Editions. pp. 272–. ISBN 978-2-8111-0273-9. Retrieved 22 March 2012. ↑ Hellen E. Ulrich, ed. (1975). Competition and Modernization in South Asia. Abhinav Publications. p. 175. ↑ Himadri Banerjee (10 July 2009). Calcutta Mosaic: Essays and Interviews on the Minority Communities of Calcutta. Anthem Press. pp. 200–. ISBN 978-81-905835-5-8. Retrieved 22 March 2012. ↑ Ismāʻı̄lı̄s: Their History and Doctrines - Farhad Daftary - Google Books. Books.google.com. Retrieved 2013-03-09. ↑ Bhattacharyya, Sourish (30 March 2013). "Faith & food in the Bohra way". Mail Today. New Delhi. Retrieved 6 May 2014. ↑ Parmar, Vijaysinh (15 February 2012). "'Community kitchen' gives Bohra women freedom from cooking". The Times of India. Retrieved 6 May 2014. 1 2 "From Gurukul to IBO varsity". Times of India. 6 November 2009. ↑ Hellen E. Ulrich, ed. (1975). Competition and Modernization in South Asia. Abhinav Publications. p. 158. ↑ "Aligarh Muslim University". amu.ac.in. Retrieved 2016-03-11. ↑ "Syedna Mohammed Burhanuddin elected chancellor of Aligarh Muslim University". Retrieved 7 April 2014. ↑ "Syedna laid to rest". Business Standard. Retrieved 18 January 2014. ↑ Mustafa Abdulhussein (27 September 2001). Al-Dai Al-Fatimi, Syedna Mohammed Burhanuddin: an illustrated biography. Al-Jamea-Tus-Saifiyah. p. 56. ISBN 978-0-9536256-0-4. ↑ "Syedna Burhanuddin donates over Rs 103cr to provide funding for interest-free loan". The Times of India. ↑ "Muharram". 2010-12-08. Retrieved 2010-12-08. ↑ "Masjid History". 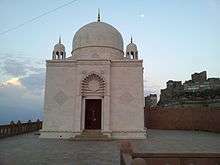 Anjuman-E-Burhani. Retrieved 2013-03-09. ↑ malumaat.co Archived 28 August 2006 at the Wayback Machine. ↑ malumaat.com Archived 28 September 2007 at the Wayback Machine. ↑ "V K Singh lauds Dawoodi Bohra community's role in 'Operation Rahat'". timesofindia-economictimes. Retrieved 2016-03-11. The Dawoodi Bohras: an anthropological perspective, by Shibani Roy. Published by B.R. Publishing, 1984.